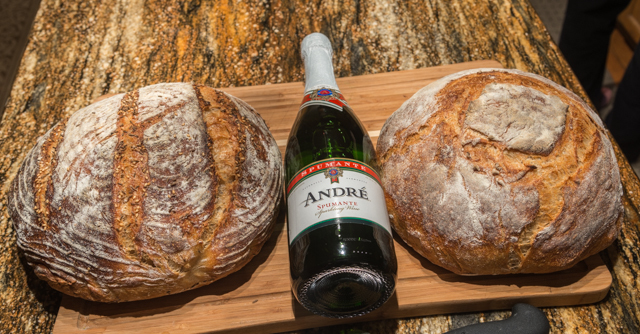 I made two loaves of Tartine bread starting with Christmas eve overnight fermentation and baking on Christmas day. I thought this was not going to work because the dough had really started to rise at room temperature and in my proofing box (microwave oven) to double it's size. I thought that I was going to have a problem with over proofing and hence, get a gassed out final loaf. But it ended up being my best bread to date. I gave one loaf to my mom and the other was ours for eating. My, this is a great recipe (Chad Robertson's) and if you are patient and learn from mistakes, I'm confident anyone can achieve similar results. Nice! Hopefully that will be me soon. That is a lovely looking crumb. 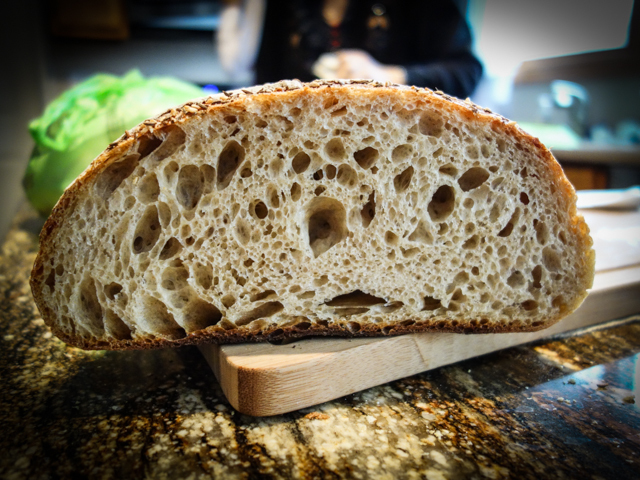 The crumb looks fantastic. 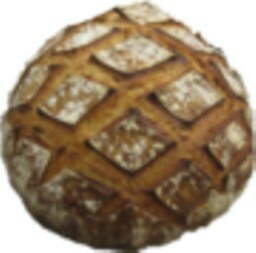 Congrats on the great looking bread. Oh nelly that looks good! yoiu go. Perfectly baked to that dark brown crust with a nice open crumb that we like so much - Well Done! great job. mind sharing with us how your recipe differs from the one in the book? Gingi, my recipe did not actually differ from the book except I went with a little more hydration (maybe added in 25g of water). Also, I might have added one heaping tablespoon of starter (that had been rising very well for me) to my initial 200 gms water and 200 grams flour the night before. I think the only thing different, after the initial bulk fermentation and folds, I put all in the fridge overnight. Last time I did this, the bread came out tasting better. Yeast is suppose to stop working below 40F but enzymes in the flour keep on working. When come for final rise, I divided the dough into two pieces and proofed for another 3 hours in the microwave oven with some boiling water in a bowl. I refreshed the water every hour with more boiling water. I will do it this way again, except I will half the dough before overnight fermentation so I can add extra ingredients and get two different loaves. I think the book suggest one does this after the first fold. I recently bought another plastic container so I can make two different loaves from one 1000 gram dough. Hope that helps. The book goes into all the details but like many, you have to re-read things (those key 30-40 pages) every time you make the bread. It's easy to miss something or skip a step. First time I put the salt in with the dry flour not giving the 30 minutes autolyse time. From Wikipedia: "Autolyse is an essential dough process. It refers to a period of rest after the initial mixing of flour and water, a rest period that occurs sequentially before the addition of yeast and other ingredients".